If you’re making home improvement and you’re looking for the best plastic floorings, it’s understandable if you’re torn between vinyl plank and laminate. After all, there’s so much information on the two out there and it doesn’t help that manufacturers keep promoting both as durable, DIY, budget-friendly products that in appearance both somehow look the same. However, these two flooring options have distinct differences that make one better than the other and that’s what we’re going to look at now. When you’re redoing your flooring, there’s a range of options from laminate, vinyl plank to traditional carpeting. 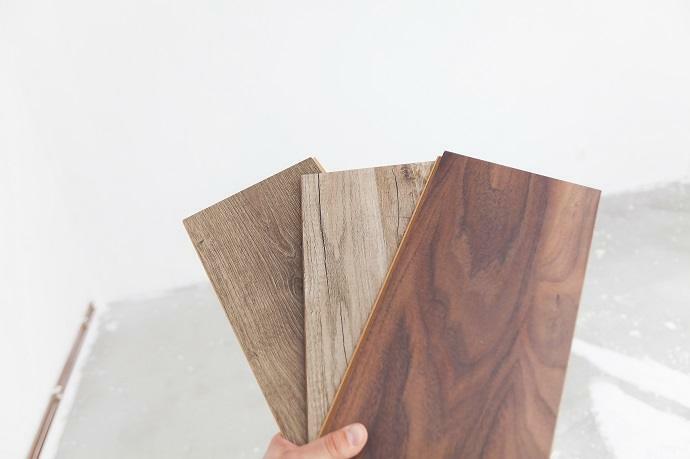 And of course, when you’re renovating on a budget, you need to weigh the pros and cons of available flooring types and finding the one that’s affordable, durable and has a great aesthetic. Vinyl planks most of the time meet these requirements, which is why for many homeowners they are the best choice. Vinyl planks, however, come with their own set of disadvantages which you need to be aware of before you settle on this option. Vinyl planks have been designed to resemble hardwood and normally come in the form of strips. There are different styles available, each made to resemble different types of wood. Additionally, a vinyl plank is very budget friendly and is a great choice for anyone who wants the hardwood look without the challenging cost and installation. Luxury vinyl flooring has certainly come a long way from the traditional vinyl which is why it’s quite popular and one of the best alternatives to hardwood flooring. It’s made from polyvinyl chloride or PVC in order to offer that firm and elastic quality. The base layer of luxury vinyl is made of a backing material that makes it strong and durable. The design layer has photographic images that mimic natural wood plans in a realistic manner. There’s also a clear urethane wear layer completely textured with 3D printing. These details on vinyl plank give it that natural look and a great protective finish that’s resistant to scratches, scuffs and general wear, so you can be sure that you won’t be replacing your flooring any time soon. Since its introduction in the 1930s, vinyl flooring has come a long way and today you have different options to choose from like Luxury Vinyl Plank (LVP) and Luxury Vinyl Tile (LVT). Just like the name suggests, luxury vinyl planks resemble planks of hardwood floors while the luxury vinyl tile comes in the form of tiles. There are different forms of luxury vinyl and they come in different grades as well. The cheaper ones are most of the time water resistant but not necessarily waterproof. The vinyl floor has so many categories that go by different names. 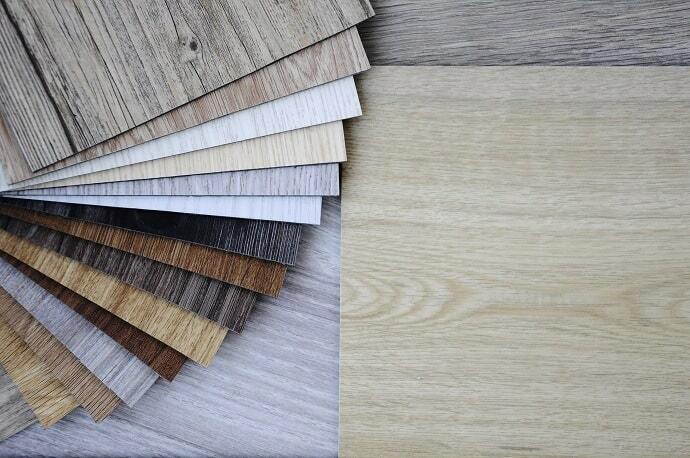 It’s sometimes called wood plastics composite or WPC, enhanced vinyl plank, rigid core, multi-layer flooring, composite core or premium vinyl plank. The rigid core luxury plank and tile flooring (LVP/LVT) is an improved version of the first generation of vinyl flooring. This version is most stable and isn’t likely to show indentation marks like those of heels or pet claws – something that the earlier version didn’t have. The rigid floor was coined from the fact that the core, which is what lies between the top and the bottom of the plank, is solid PVC. As such, you never have to worry about having an uneven floor because one of the rigid core benefits is that it doesn’t telegraph subfloor imperfections and as such is very easy to install over imperfect subfloors. In that case, you can even install it over hardwood or tiles. It’s dimensionally stable which means that it doesn’t contract or expand like traditional vinyl floors. You also never have to worry about the effects of direct sunlight on your floor and when installing there’s no need for acclimation time. It can be used anywhere from the basement to the bathroom and kitchen. It might also help to check COREtec flooring reviewed so as to make an informed decision. The WPC luxury vinyl plank and tile, like the rigid core, is also a much-improved version of the traditional LVT. It’s made of plastic and wood though most of them nowadays don’t contain wood. Instead, some have cork backing which helps in cushioning and absorption of sound. Just like the rigid core, WPC flooring is also waterproof, can be installed over uneven or imperfect floors and has dimensional stability. The floors can be floated eliminating the need for nails or glue when installing. The visuals of the floor have improved over the years with additional features like HD printing. One feature that helps both rigid core and WPC floors stand out is the fact that they are easy to maintain with sweeping, vacuum cleaners or steaming mops. They can be used anywhere from the bathroom, kitchen to the basement. The luxury vinyl plank and tile flooring is a common name for the first generation of vinyl floors. Most people use it to describe the entire category, so you need to be sure when you’re speaking with a salesperson. The LVP and LVT floors are a great choice especially if you’re on a budget. The only thing you need to take into consideration is where you will be installing the floor. If you have imperfect subfloors or the room you’re installing in has a lot of direct sunlight, then you are better off staying away from this category. This is because, with this kind of floor, there’s always the possibility of warping, cupping or gapping. The floor is also susceptible to scratches and dents. Basically, laminate flooring is constructed from layers which are stuck together through a process called lamination. The main layer is crafted from very dense fiberboard that’s laminated into planks making the material more rigid than luxury vinyl. Laminate flooring is easy to install through the click and lock installation process also known as the floating floor system meaning that you don’t require glue or nails to install the planks on the subfloor. The photographic image that’s found under the resin layer of the planks emulates different materials like stone and wood. The fact that the floor floats means that water isn’t usually the best choice when you’re cleaning as moisture and humidity can end up damaging the floor because of the sponge-like fiberboards and the aerated gaps between the floor and the planks. This means you should be investing in either cheap vacuum cleaners or laminate mops. It also means you shouldn’t install laminate floors in areas such as the kitchen and bathroom and anywhere else where there’s a lot of moisture. When you’re deciding on the laminate floor for the first time, it’s very easy to get lost in the sea of information that you can find out there. The bottom line is that when you’re deciding on laminate floor, the most important thing you should consider is the look that you’re going for. Do you want a hardwood look or a polished stone one? In addition to that, the functionality of the floor should also be considered like your installation plan and how long you want the floor to last. The most popular choice when it comes to laminate flooring is the wood grain type. If you’re on a budget or looking for something temporary for your floor, you can go for the laminate planks that resemble wood instead of real wood. This will save you money and not to mention that it’s very easy to find a wood pattern as well as color that matches the décor of your home. This is another thing you should consider in laminate flooring. Glued refers to the kind of flooring that needs to have special kind of adhesive applied to the grooves and tongues of the planks. This is often considered as the traditional laminate flooring and when the glue dries, the planks can hold up for years. Pre-glued means that the glue has been applied already to the grooves and tongues of the tiles or planks making it easy and quick to install without creating a mess. Molding and end pieces are very important to put into consideration when you’re installing laminate floors. Most laminate floors have designated pieces that are designed to match the color as well as the texture of the floor. However, compared to their wood counterparts, these pieces are normally bigger and can prove cumbersome when used incorrectly. Without them though, the room will appear unfinished with all the exposed edges. Carpet reducer/end molding is a piece that connects laminate flooring to other surfaces that are of different heights. Reducer strip is usually a main transitional piece that’s often used to connect laminate flooring with another flooring of the same height. T-molding, on the other hand, is a piece used between doorways to connect together two laminate floorings. When you’re deciding on the best flooring for your house, you might face a hard time deciding between a vinyl and laminate floor. This is because both products have the same functionality and may even look alike. However, when you look at each one of them, you’ll start noticing the differences. If you’re searching for the look of hardwood in your home, then you might consider either vinyl or laminate flooring. But even when that’s the case, how do the two stack up against each other in terms of durability? Vinyl flooring is durable because it holds well even under pressure. Also, it doesn’t scratch easily hence is suitable even in houses with pets and children running around. However, due to the fact that it’s softer than laminate and hardwood, it’s bound to get damaged in a sense that the planks can rip especially when you’re dragging furniture. Over time, it can also dent especially in areas where there’s heavy furniture. Laminate floor, on the other hand, is durable and is often a good choice for anyone who has kids as well as pets. It is resistant to damage and doesn’t require finishing over time like traditional hardwood floors. However, la aminate is susceptible to chipping and scratching over many years. You can solve this by adding outdoor rubber mats on the affected areas, especially the patio or deck. One of the disadvantages of hardwood flooring is that it can get ruined when exposed to water. Both laminate and vinyl offer that look of wood, but how do they compare when they are exposed to water? Vinyl flooring continues to grow in popularity due to the fact that it’s water resistant. This means that it can be used in the kitchens, bathrooms and other areas that are exposed to water and humidity. As long as you do a proper installation, you never have to worry about your floor getting damaged due to water. Laminate flooring, on the other hand, should never be exposed to water. Water and high humidity can lead to the floor gapping, buckling, warping and even the planks and tiles separating. Most people would rather do floor installation by themselves because it ends up saving them a lot of money. 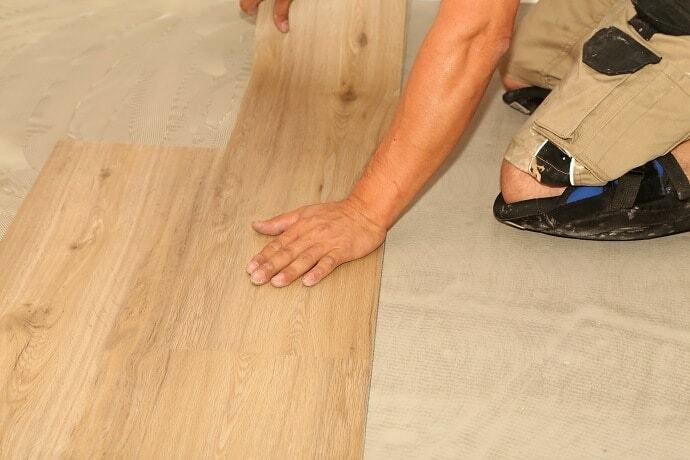 With knowledge and the right tools, you can easily install vinyl or laminate flooring. Depending on the type of vinyl you buy, you can install it in two ways. Vinyl flooring that has a tongue and groove design clicks together easily. The other type of vinyl flooring is the peel and stick which comes with a backing that’s peeled off to expose the adhesive hence you only need to apply each plank to the prepared floor. The planks can easily be cut with a utility knife for that perfect fit you’re looking for. On the other hand, you can also install laminate planks and tile on your own. However, unlike vinyl, laminate floor requires more tools which include a hand saw and a circular for cutting each piece. If you’re installing the laminate below grade, you’ll need a vapor barrier that’ll offer protection and finishing for floors against moisture. Before you install laminate flooring, you also need to apply an underlayment over the subfloor though there are some laminate floor planks that come with the underlayment attached. 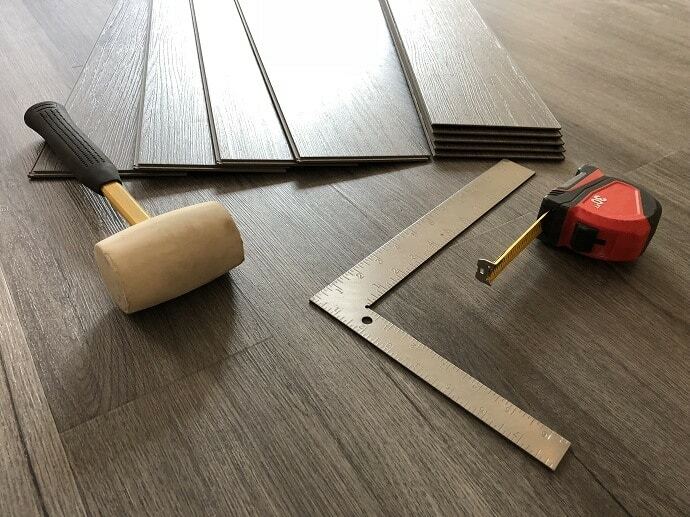 Due to this, it’s clear that vinyl flooring is much easier to install due to the fact that it requires less tools and the planks can be easily cut to fit perfectly. Most people who go for either vinyl or laminate flooring do so due to the simple maintenance that the two require. Compared to laminate flooring, vinyl planks are easier to clean as a wet mop will do the job just fine. However, it’s important to note that it’s not recommended to pour water on the planks as the water can end up breaking the adhesive and tearing them. You also don’t need harsh cleaning products as a mild one will do just fine no matter the mess on the floor. Vinyl floors also don’t need to be waxed as regular cleaning will still leave your floor looking shiny. The biggest concern in the maintenance of vinyl floor is denting caused by heavy furniture. This can be fixed with floor protectors which prevent denting and damage to the floor. Laminate flooring is easy to maintain and clean but there are certain precautions that you need to take to prevent damage to the floor. One thing you should avoid is the use of water when cleaning. Dry water and other spills can damage laminate floors easily. Also, ensure that you use soap free products when cleaning and if possible only use products that are meant for laminate floors. Laminate flooring like vinyl doesn’t require waxing as the shine and beauty is retained over time. If you have pets and feel worried about the kind of flooring that will not get damaged easily, then both laminate and vinyl flooring are perfect. They both don’t scratch easily and withstand high traffic even with kids and pets running around. The good thing about laminate and vinyl plank is that both aren’t one size fits all kind of floors. They come in different styles, colors and sizes but there are a few differences between the two. Vinyl plank flooring comes in different widths and lengths. The planks are normally 4 to 8 inches wide and 36 to 48 inches long. Since vinyl is soft, you can easily cut the planks for the perfect fit. In terms of color and styles, vinyl comes in either the whitewashed oak for that shabby chic look, black for modern flooring, mahogany or cherry for that classic look. Laminate planks, on the other hand, come like 4 to 16 inches wide and 36 to 48 inches long. You can also cut the planks into smaller sizes but is a lot harder than vinyl due to the fact that it’s wooden. The biggest advantage that laminate has over vinyl, however, is the fact that there are so many styles and colors available. It’s designed to mimic the look of ceramic tile, travertine as well as stone making it ideal for most homeowners. If you have ever stood on a bare floor for many hours, you know just how uncomfortable that feels on the legs. Since vinyl flooring is installed directly on the subfloor, it’s not the most comfortable option. It can feel cold on bare feet because there’s no insulation between the planks and the subfloor. Laminate flooring, on the other hand, is more comfortable due to the fact that it’s thicker than vinyl. It can also be installed with a foam underlayment beneath which means that it won’t feel cold. One of the reasons most people go for vinyl or laminate is because they are cheaper than traditional hardwood flooring. However, they are different in term of areas they can be installed at. Vinyl flooring is water resistant and can be installed in areas like the kitchen, bathroom, basement or any other place that’s exposed to water. On the other hand, water will damage laminate floors easily and as such can only be installed in areas like the living room, bedroom, dining room and anywhere else where it can’t be exposed to water. When it comes to cost, vinyl flooring is much cheaper to buy and install. The fact that it comes in tongue and groove design and peel and stick design makes it easy to install on your own. Vinyl planks go from about $.40 per square foot to $3.00 per square foot for the luxury vinyl planks. The planks are thin and can be cut easily with a utility knife to get that perfect fit, saving you a lot of dollars you would have spent on a technician. Laminate flooring, on the other hand, is a bit expensive and is harder to install if you don’t have the right tools raising the need for an installation technician. Laminate flooring goes from about a dollar per square foot for the 7 mm-thick planks to $3.00 per square foot for the 12 mm-thick planks. Laminate flooring, when installed, may feel hollow underfoot and as such transmit noise easily when you’re walking. Installation of a foam underlayment has been shown to reduce this hollowness as well as the noise. Vinyl floor, on the other hand, is quieter due to the fact that sound doesn’t echo the way it does on laminate floors. Dishes dropped on vinyl floors also don’t break easily which is something that’s not possible on laminate floors. When it comes to vinyl and laminate flooring, yes, spending more will mean a better quality of flooring. If you have decided to change flooring, then its better if you go all the way and get something that’ll last you for long. There are cheaper versions of both vinyl and laminate but they won’t last you as long as an expensive design. Laminate floor, as mentioned, isn’t water resistant and as such you need to get one that’ll stand the test of time and can handle spills. When it comes to vinyl, you need to get better quality that’ll not rip or warp after a short time. If you have decided to change your flooring, you can be confused with so many options out there. Some of those options are vinyl and hardwood. Both bring a sense of elegance to your home, but in terms of durability, vinyl planks can tear and rip and are also prone to dents especially in areas where there is heavy furniture. Hardwood is prone to scratches but harder and engineered wood is more durable than the exotic one. When it comes to cleaning, vinyl requires no wax and because it’s water resistant, it can be wet mopped, swept, dusted or vacuumed. Hardwood needs to be cleaned with products that are designed only for hardwood and without wet mopping as water damages the wood. Vinyl plank comes in a variety of styles that mimic real wood giving your house a natural look. There are also a variety of colors to choose from including white, ebony and cherry. Hardwood also comes in a variety of styles including exotic and traditional and there are also so many available colors in the market. Basically, hardwood floors are way more expensive but are prone to damage especially when exposed to water in the long run. For one, a vinyl plank is durable and resistant to scratches. It can, however, tear and dent especially in areas where there is heavy furniture. Engineered wood, however, is susceptible to chipping as well as scratching in the long run. Vinyl is also water resistant which means it can be wet mopped. Engineered wood is way more water resistant and can be cleaned with a damp mop or cloth and with cleaners that are designed for engineered hardwood. The lifespan of vinyl is about 5 to 20 years depending on the quality but engineered wood has a life span of 20 to 100 years making it way better option for homeowners. Hardwood flooring is usually better than laminate in that it’s of higher quality because it’s ¾ inches of solid wood that has been cut from a tree. Laminate, on the other hand, is basically particleboard that has a photo layer that resembles wood and a layer of plastic on top. Just because wood is better doesn’t mean that it’s better for your installation. In so many ways, laminate performs better, is cheaper and easier to install than hardwood. It also doesn’t need as much pampering as hardwood does. It can be hard deciding between engineered wood and laminate. Engineered wood is aligned closely to solid hardwood since it incorporates a thin veneer of natural wood that’s located on top of the plywood. Due to the fact that the plywood layer often runs perpendicularly to each other, engineered wood is more dimensionally stable. It’s also higher on the price range than laminate. Laminate flooring features a high definition image of wood that’s fused to fiberboard and topped with a hardy transparent wear layer. Laminate wood has come a long way and is in competition with engineered wood with manufacturers making the planks to look more like wood. When you’re installing vinyl plank start with a smooth floor by grinding with a sanding belt any bulges, lumps or humps on the floor. Measure the room width and then divide that with the width of the plank before you begin laying the planks on the floor. Ensure that you trim doorjambs in a way that you can slide the planks underneath. Make sure that you leave gaps along the wall by inserting shims. These gaps are important as they allow the flooring to expand freely whenever the temperature changes. Work on snapping the planks together by joining each plank to the end of the previous one and then working your way down the plank side snapping into the previous one as you go. Tap in the end planks by hooking the pull bar to the end piece and tapping the seams closed. First, you need to inspect every plank before you even begin installing. For the first row of plank that will go along the straight walls, ensure that you remove the tongues on all the long side joints as well as the short side of the plank using a table saw. If the walls are uneven, that can be fixed by tracing contour with a compass on the side of the plan and cutting with a jigsaw. Assemble the first row with the tongues facing sideways from the wall. Insert the end tongue to the end groove and ensure that you rotate it downwards so as to assemble all this time keeping the planks aligned and the joints closed. Ensure that you leave enough room from the wall for expansion. Using a table saw, cut for new rows and then insert the tongues of the plank for the second row into the groove of the first plank until the edges meet and then rotate until the joints meet. Insert the tongue of the second-row plank into the groove of the first-row plank at a slight angle until the laminate edges meet. Next, rotate down until the joints lock. 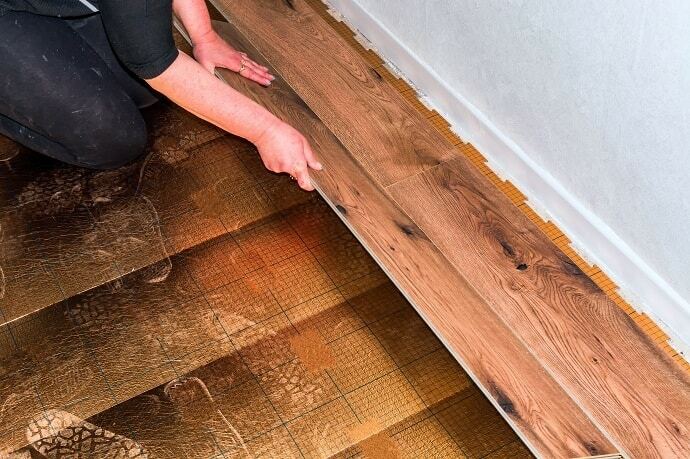 After you have laid down all planks, apply a silicone sealant to the perimeter so as to create a watertight seal. Compared to other flooring types, vinyl is the easiest to maintain. For everyday maintenance, you just need a broom or a vacuum cleaner. For thorough cleaning, start by sweeping or vacuuming with one of the great carpet stain removers to get rid of debris and then you can do wet mopping. By now you know better to stay away from water if you have a laminate floor. Water, in the long run, ends up damaging the floor. So how do you clean and maintain it? Basically, dry mopping will work and you can use mops like the microfiber, steam or a spin mop. Ensure that you wipe spills immediately after they occur to maintain the quality of your floor. Radiant Heating – which one is better for it? The heat that’s usually applied directly to the floor panels or the walls tends to keep properties warm even when the weather is at its coldest. Luxury vinyl flooring is a great conductor of heat especially when it has been paired with an underlayment and so is laminate flooring. In terms of radiating heat, both floors are at par. Can you put vinyl plank flooring over laminate? If you have the laminate floor installed and are second guessing it and want to change to vinyl, it would be easier putting a new floor over the old one. However, it’s not recommended at all to have vinyl flooring over laminate flooring. This is because laminate flooring is installed in a floating manner and is not glued or nailed to the subfloor. Vinyl flooring is flexible and due to that, it should go over a solid and well-adhered subfloor and not over laminate flooring. Do you need underlayment for vinyl plank flooring? Most of the time, vinyl flooring has been designed to just lay directly on a subfloor. The type of subfloor and vinyl flooring, however, will determine if you need an underlayment or not. Glue down vinyl for instance doesn’t need an underlayment and in this case, you just need to install the planks directly on the subfloor. Whenever you add something to your home, it affects its value. Good quality luxury vinyl will raise the value of your home, but a poor quality will end up affecting its resell value. When it comes to laminate, the material isn’t as impressive as vinyl, but high-quality laminate will definitely increase the value of your home. If you’ve decided to renovate your house or have bought a new house and need to change the floors, you can either go for vinyl or laminate flooring. Both have their advantages and disadvantages as you have seen and it’s up to you to decide on the one that works best for you. Photos from: [email protected] / depositphotos.com, rades / depositphotos.com, studiodin / depositphotos.com, NikD51 / depositphotos.com and Malleo / depositphotos.com.